Serpentine is the true stone of our Mother Earth, it’s forgotten magical history, and it’s epic future. It is a magnesium Silicate Mineral that occurs in a rather fibrous form. It is a heavy, dense stone that is often linked to the appearance of a snake or reptile. It varies in colors from yellowish-greens to deep green and in some cases even black. This one of a kind stone is spread across the globe, however its most commonly found in the deposits of Great Britain, USA, Brazil, and South Africa. 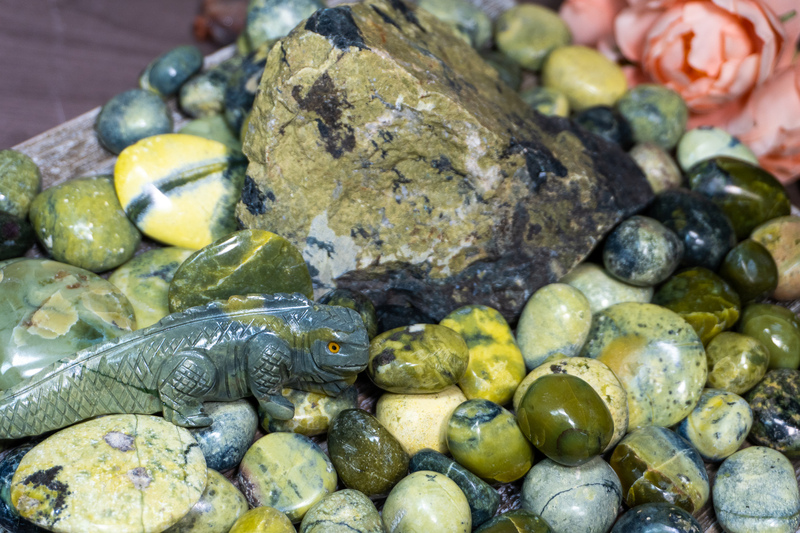 It’s color has birthed some of its popular nicknames as “New Jade”, “Olive Jade”, and “Snake Jade”. The word Serpentine itself is derived from the Latin term “Serpentinus”, which quite literally translates to “something resemblant of a serpent”. This tells us that those who coined the name for this mineral understood that its aesthetic appearance is similar to that of a serpent; or perhaps they understood the immense knowledge this stone offers which is also very similar to that of a serpent! Kundalini energy is very familiar with this stone-this unique energy is most commonly referred to as “serpent power” and resides at the very base our spines. When stimulated and risen, this energy will rise to the top of the spine and wrap itself around the sacrum. Serpentine stimulates this energy in all of us, aiding us in accessing deeper psychic and spiritual upgrades. Kundalini energy works its way up the spine stimulating, opening, and balancing all chakras and ultimately opening ones mind to an array of spiritual insight. Keeping a piece of serpentine close to you during meditation will help to facilitate these intense energies and open one up to our true spiritual nature. 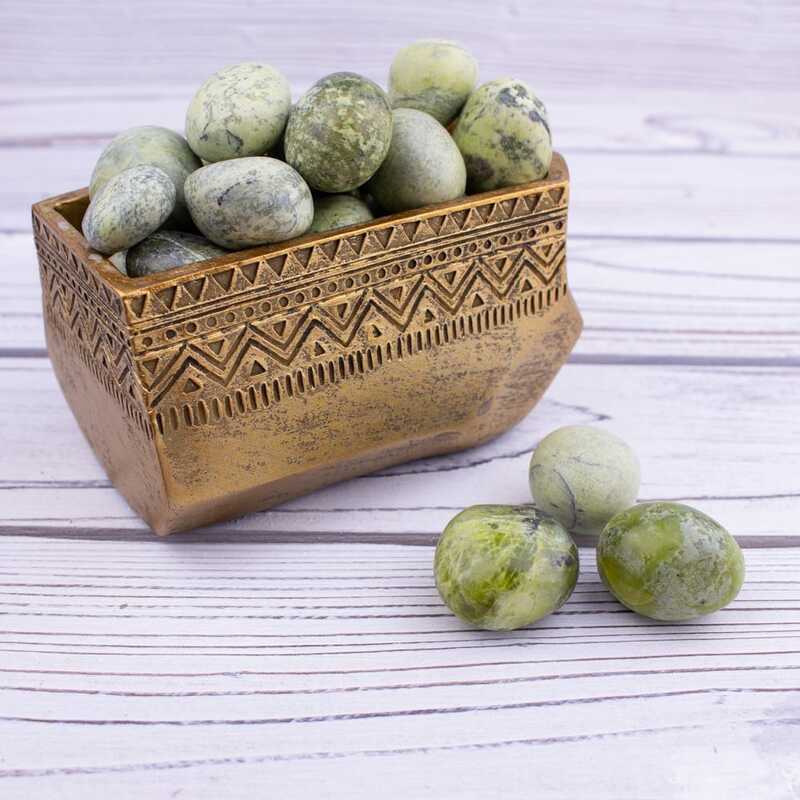 Serpentine is an excellent stone for clearing any energy blockages within the chakras, allowing us to develop a healthy flow of energy throughout the emotional and physical body. Interestingly, the snake is also revered as a symbol of good health and is symbolized throughout medical establishments, hospitals, and even on most ambulances. The reason for this is because the snake sheds it’s skin and emerges from its old scales refreshed and anew. Serpentine works hard to restore our energy and replenish the cells in our body. The serpent energy within this stone will help to heal the physical body and remove any negative thinking patterns associated with past traumas. Serpentine allows us to gain a deeper understanding of the many dimensions that Earth exists in. It carries within it the blueprints of our planets future evolution and distant past. It attunes us too and makes us comfortable with change because it allows us to see the big picture and learn from nature-which has endured far more than the span of humanity itself. Those who wish to learn more from the Faerie realm, Devic realm and even our plant and animal kingdom will benefit from this stone greatly. Because Serpentine contains significant amounts of Magnetite, it has a feminine/magnetic energy (like our planet) that pulls records of Earth’s existence into itself, allowing us to learn from it’s documentations. This stone calls out to and shares it’s deepest secrets with Mages of nature and Earth healers alike. Those who wish to assist Earth in the coming transformations will have no problem learning a thing or two from Serpentine.